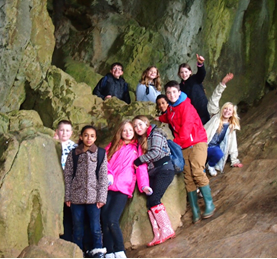 The Allenton Big Local project recently provided Merrill Academy PTFA with funding through the Community Chest for twenty children from Allenton to attend a weekend residential trip. Lynn Greenhouse from Merrill PTFA has kindly provided us with this report on how the trip went. 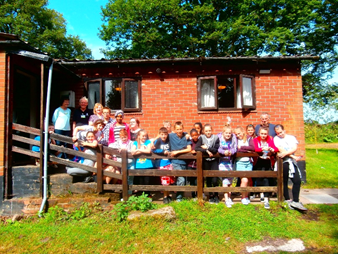 This year we were lucky enough to obtain a Community Chest grant from the Allenton Big Local fund to take a group of twenty children from the Allenton area for a weekend residential visit to Dimmingsdale Youth Hostel. The trip took place in early July, and it was brilliant. The children who attended were delighted and amazed by what they did, saw, and learnt throughout the weekend. More importantly, they were surprised and proud of their own personal achievements. I’ve had an amazing weekend! We spent each evening sitting with the children and talking through what they had experienced during the day. We asked them what new things they had seen, what they had learnt, what skills they had acquired and how they had felt. They were unanimously happy, excited and proud of what they had done. During the visit, the children enjoyed themselves, made new friends and saw nature and wildlife. Seeing the swallows prompted a discussion about the migratory habits of birds, which interested the children. We suggested that, when they got home, they start to look out for which birds are in their local area in the summer but migrate (and so are missing) in the winter. We also discussed other animals that are present in the countryside and also in Allenton, such as the urban foxes which are appearing in cities now. We’ve seen swallows who have come from Africa and nest and feed in England in summer. Food can sometimes be an issue on group trips, especially if children tend to only eat the same meals all the time. Mealtimes gave us an opportunity to introduce the children to foods that they may not have tried at home. It was surprising how many children said ‘I don’t eat this’ who eventually tried and liked it because they were eating in a social environment with their peers. Some families don’t always sit down and eat together, so mealtimes on the trip were an opportunity to strengthen social interaction and gave the staff another opportunity to get feedback from the children on how they felt about the activities, as well as the food! The children had a good cooked breakfast each morning to give them the energy to run around in the woods all day. The children were particularly interested in the ‘chained oak tree’. This is a place of interest close to the Youth Hostel, deep in the woods. There is a local legend about a curse which stated that if the branches fell from the tree the Lord of the Manor would lose an heir for every branch that fell off. To avoid this, he chained the branches to the tree. Now, centuries later, the tree has grown around the chains but the story still persists. This prompted discussion on the history, the likelihood of curses being real and a great deal of interest in how the tree grew around the chains. It fascinated everyone on the trip. Again, it was a chance to relate this history to their own local area, such as the finding of the ‘Allenton Hippo’. At Dimmingsdale I’ve enjoyed my time and learnt all about the chain oak tree. The children said the best things about the trip were ‘jumping off rocks’, ‘climbing up to Thor’s Cave’, and ‘playing with mates in the woods’. The initial reaction to there not being a television at the Youth Hostel was one of horror but, within ten minutes, the children were playing outside – climbing, making dens, devising team games and enjoying being children. This need to amuse themselves prompted discussions between them and it was interesting to see the relationships develop and their characteristics come to the fore as team dynamics evolved and they took positions as ‘leaders’ or ‘followers’ in the games they played. Some of the children were full of curiosity and came in firing questions to staff about the flora and fauna and then went off again to check the information they had been given. The best thing I’ve done this weekend? Playing with friends in the woods and going on walks. What was most evident was the sense of achievement and pride in the children. When they realised they had actually walked over five miles, they were astonished but so pleased and proud of themselves as they ‘never walk anywhere at home’. The fresh air and exercise was so much better for their health and wellbeing than sitting in front of a television or computer game and, hopefully, since they enjoyed it so much, the children will do more activities when they’re back in their local area. They were thrilled to see the flocks of sheep and cattle roaming the countryside and paddled in the stream as it flowed over the rocks. 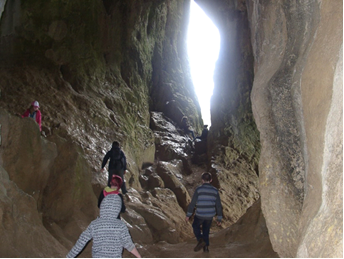 The hike to Thor’s cave also provided an opportunity for the children to get to know the adults in the group. Many young people do not get the chance to talk to adults, other than family or teachers at school, so it was good for them to develop the ability to chat to adults in an informal setting, which is a useful skill for the future. I was proud of myself because I’m scared of heights and I went in the cave. The children were also proud of their ability to climb up to Thor’s Cave and, once there, were astounded by the beauty of the countryside. Some of the children had never been out of their local area and so it was a revelation to them. What is more important is that, as we discussed this, the children were asked to consider how beautiful their own local area actually is. Although small, there are little pockets of beauty in their area and they shared parts of Allenton they liked with others. Their ‘beauty spots’ may not all be green fields and caves but the children went home hoping to find others near their homes, be they gardens, parks, or buildings. given them opportunities to learn and solve problems for themselves. 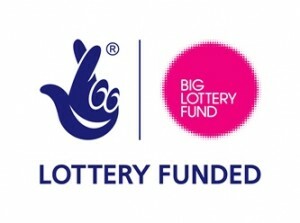 Thank you to the Allenton Big Local team for the help you have given.